Deputy mayor of Ukrainian town praises "amazing volunteer spirit" as pilgrimage to Rebbe Nachman's tomb nears. Hundreds of volunteers are at work in Uman preparing the area around the tomb of Rebbe Nachman of Breslov for the annual pilgrimage that takes place at Rosh Hashana. Anatoly Shergeyd, who is in charge of coordinating activity at the site with Ukrainian authorities, said at a news conference that he hopes live broadcasts from the site will reach Jews throughout Ukraine "and rekindle the Jewish spark in them, which was dimmed by the Soviet rule over the years." Deputy Mayor Sergei Pavlovich said roads are being repaved, infrastructures around the tomb site are being prepared, and that police are preparing to maintain order in the pilgrimage area. He expressed his wonder at the "amazing volunteer spirit" exhibited by the volunteers erecting the improved tent city at the site. Ukraine's Chief Rabbi, Rav Yaakov Meir Bleich, had criticism for Ukrainian authorities, however. He said that although over 200,00 people come to the graves of tzaddikim annually, the Ukrainian government fails to understand the importance of the matter and has not made any investments in it. A gallery with 1,500 seats has been added to the study hall at the site this year. 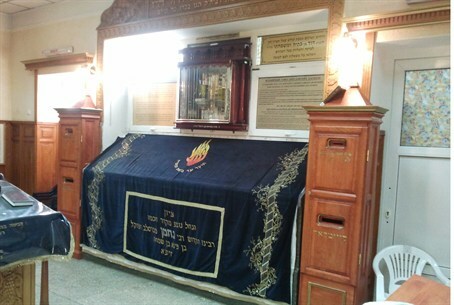 Rebbe Nachman of Breslov, who died in 1810 at age 38, was the founder of the Breslov Hasidic movement. During his lifetime, thousands of followers traveled to be with him for the holidays of Rosh Hashana, Hanukkah and Shavuot. On the last Rosh Hashana of his life, Rebbe Nachman stressed to his followers the importance of being with him for that holiday in particular. Therefore, after his death, an annual pilgrimage to his gravesite was held on Rosh Hashana. This tradition has continued for more than 200 years.